I'm running way behind in making posts about our travels this summer, but I guess it will give me something to do when we're sitting in one place for the winter months. This blog will conclude our visit with our good friends Bill and Debi and touch on a few more sites we visited before leaving Graham, WA. On August 19th Bill and Debi came over to our campground at Ranier View RV Park and led us on an all day excursion into Ranier National Park and the surrounding areas. The smoke had been so bad for several days now that getting a good view of the peak was a rarity. We were able to capture several views of the peak from a couple of pullouts along the road inside the park. A bit further down Paradise Road and we hiked down a short trail to view the Narada Falls. This is a view of Mt. Ranier from the Henry Jackson Memorial Visitor's Center. Several trailheads begin behind the visitor's center, even some treks up to the peak itself. Today we limited our hiking to a few short walks because we wanted to get to see the entire park (via main roads). This was one such short walk around a small, but pretty lake. The weather was great today, but by late afternoon the smoke was beginning to roll in again and limit the views. 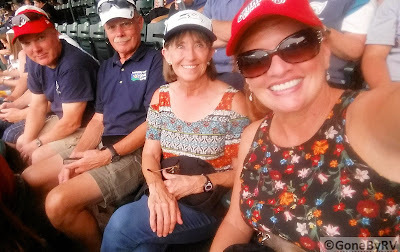 On our last night in the Seattle area, the four of us grabbed the light rail and headed in to Seattle to watch the Seattle Mariners play the Houston Astros. At this point in the season, the Mariners were still in contention. (Like my Washington Nationals, however, their hopes for a playoff spot wouldn't last too much longer. This didn't deter us from having a good time at the ballpark, however. Safeco Field has a roof which can be closed, but even with all of the smoke from fires, this night it remained open. The "Fischer jinx" was not to be tonight as the home team won by a score of 7 to 4. We left the next morning to head up to stay in an Escapees' Park near Chimacum, WA (on the Olympic Peninsula). We can't say enough about what great hosts Bill and Debi were while showing us around this part of their state and inviting us into their beautiful home. THANK YOU AGAIN BILL AND DEBI!